All cat lovers can agree that cats are profound creatures. One minute they love you and the other they want to kill you. And that’s why we love them so much! They’re so unpredictable. And because of that, cat parent’s are usually dumbfounded when it comes to the emotions of their furbabies. Cats have individual and unique ways of communicating and expressing their feelings. So, the next time you’re hanging out with your cat, watch out for these subtle signs of affection. They just might let you know how much your kitty cares about you! Some cats are vocal, and some are not. But all cats tend to communicate their affection and feelings with their eyes. The most common way cats show you they love you is by giving you a slow blink. Slow blinks indicate trust and comfort. So if you feel the same way, reciprocate this feeling by giving them a slow blink back. Doing this to cats is also a way to let them know you mean no harm. Since cats can’t talk, most of their communication comes from body language. Other than their eyes, the next most expressive body part is their tail. 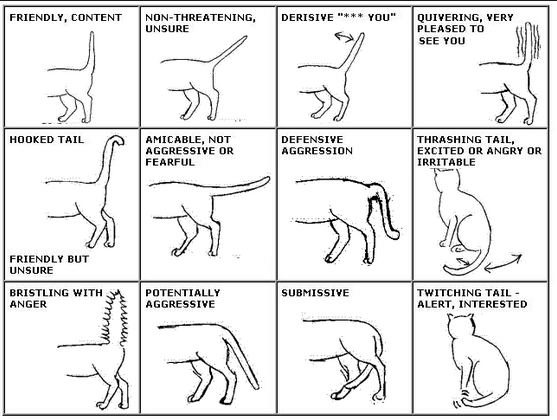 This useful infographic from Life with Cats will help you decipher what your cats body language means. Kneading is common behavior for cats. This goes back to when they were kittens and kneaded their mother’s belly for milk production. Some adult cats continue to knead when they’re feeling playful or want to show their humans some affection. If your pet is constantly kneading your legs, that means they love you. And if they do this after a pet, they’re returning the affection. If you’re around “kneady” cats, thicker clothing will prevent you from feeling the painful side of love. The belly is the most vulnerable spot for cats, so they only expose their bellies to people they completely trust. But a cat exposing their belly does not necessarily mean an invitation to pet their bellies. The belly area of their body is very vulnerable, so touching it may be stressful or even threatening. If you’re feline friend exposes their belly at you, try petting them on their head of back. This will prevent you getting attacked and end with a satisfied cat. A gentle head bunt is one of the most affectionate actions a cat can do to their human. When cats head bunt you, they spread their signature scent and mark you as their “territory”. So, when cats give you a gentle head bunt, they’re giving you a membership to their club. Cats are finicky creatures, especially with the people they want to befriend. So, if you’ve ever received any of these signs of affections from a feline friend, then congrats! They’ve chosen you to be a part of their club. But if you haven’t experienced any of these, don’t fret. No two cats are exactly alike which means no two cats show affection the same way.